The UK economy enters 2019 in an uncertain environment. These charts are aimed at capturing some of the key current economic issues that investors and savers might want to consider for 2019. Chart 1: The world economy has lost momentum in recent months and has slowed. This is shown here by the OECD’s leading economic indicator that captures what is happening in major western economies. It is also borne out by recent data showing the euro area on the brink of recession, and by the change in tack by central banks in the US and China. Last year, China slowed, prompting a recent easing in policy to help underpin growth. Meanwhile, the US Federal Reserve Board has put its previous policy tightening on hold. Chart 2: Although the world economy has slowed, this follows a period of strong growth in the last two years, and thus we should not panic. Moreover, as chart 2 shows, the size of the world economy has continued to increase, shown here in trillions of dollars. More of global growth is coming from the emerging economies, led by China, which helps explain the increased focus by financial markets on the pace of growth there. The message from this chart, though, is that despite the current slowdown, the trend for the world economy is still up. After strong growth in 2017 and 2018, we expect the world economy to slow to a steadier pace of growth this year. One of the big issues for the world economy is that global debt levels have continued to rise. Chart 3 captures a worrying trend. In the run-up to the 2008 global financial crisis, debt levels soared, as seen in the two bars on the left of chart 3 (showing 2003 and 2008). Perhaps, just as worrying, is that since then global debt levels have continued to increase, as shown in 2013 and 2018. This helps explain why there have been ongoing worries about global bonds. Despite this, in 2018 we did not share in the widespread view that global bonds were entering a bear market, believing instead that low inflation would help prevent yields rising too far, and so it has proved to date. But the level of debt means such worries will persist, and also helps explain why central bank policy has taken centre stage (as many governments have less room for manoeuvre through fiscal policy). Debt has risen in the UK, too. Chart 4 shows the ratio of debt to GDP in the UK. This is now at a peacetime high, but we expect it to decelerate both in the coming year and following few years. Charts 5 and 6 focus on the rate of growth in the UK. Chart 5 shows economic growth since the 1950s. Since the 2008 financial crisis, there has been a downward revision to the trend rate of growth in the UK, with low productivity growth being one factor. The UK is very imbalanced: some sectors and firms enjoy high productivity, but this is not reflected across the whole economy with a large tail of low productive firms; then there are other imbalances such as between London and the rest of the country, coastal-inland, urban-rural, skilled versus unskilled workers, home owners versus those who rent, and between old and young. The low rate of growth in the decade since the 2008 global financial crisis means that when we compare the pace of the present recovery with previous ones since the second world war, this recovery is the weakest. This is shown in chart 6. The bottom of each economic cycle is shown at zero on the bottom left of the slide. The cumulative rate of growth in each recovery is on the vertical axis, and the length of the recovery, in quarters of a year, along the horizontal axis. 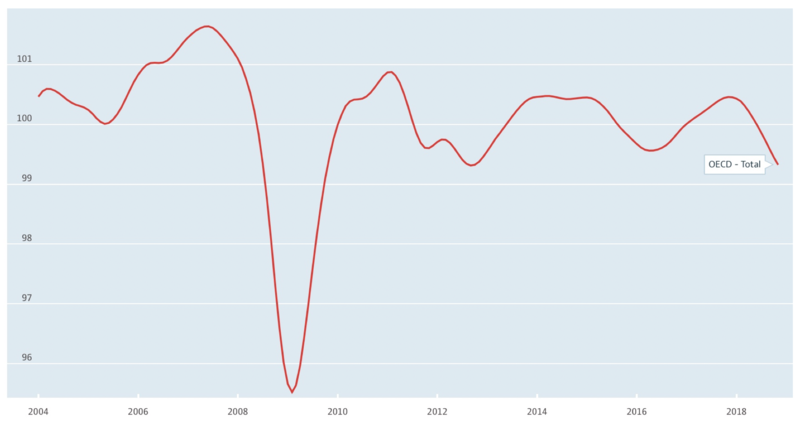 The current economic cycle is shown in bold, and over time, has not gathered momentum like some previous recoveries. The good news is that the UK has enjoyed record employment, shown in chart 7. A comparison is shown with the US to illustrate how impressive the UK performance has been. Despite that solid employment growth, wage growth has been sluggish. Indeed, one characteristic of the UK in recent years has been low rates of economic growth, productivity growth and wage growth. But it is only recently that the pace of wage growth has started to accelerate, shown in chart 8. If this continues, then this backdrop should help underpin consumer spending. Chart 9 points to a deceleration in UK inflation, as the impact of sterling’s depreciation of recent years wears off. Inflation looks set to decelerate towards the 2% inflation target. The interesting issue is whether there is any inflation feeding through from the rise in wage growth. Chart 10 shows that policy rates in the UK are low. Despite low rates, there has been a significant slowdown in monetary growth and in bank lending. We expect the Bank of England to keep rates on hold for now, but in view of the low level of rates they have a bias to tighten policy. This raises some key questions, that we have alluded to before, and that need to be taken into account by not just policy makers, but savers and investors, too. In terms of monetary policy, we may ask: What constitutes a risk-free asset? Previously, it was seen as gilts and housing. Then, in this environment, an important consideration is whether markets are pricing properly for risk. Is there a need, after low rates, for a return to monetary discipline? And can markets and economies cope with tightening? All of these questions help explain the need for any tightening in monetary policy to be gradual and predictable. Finally, there is Brexit. Raw politics has taken centre stage, reinforcing the uncertainty that has been hanging over UK financial markets. The market impact has been seen largely in sterling’s performance, shown here versus the dollar in slide 11. The immediate political focus is on whether the UK leaves the EU at the end of March, to be followed by a transition period, or whether there will an exit on World Trade Organisation terms (‘No deal’) or an extension of Article 50. Beyond that, success depends upon the UK focusing on three inter-related areas, of domestic economic and financial policy, our future trading relationship with the EU, and our position with the rest of the world, from which around 90% of future global growth is expected to arise. Overall, as these charts illustrate, there are conflicting economic and policy pressures impacting the immediate UK outlook.